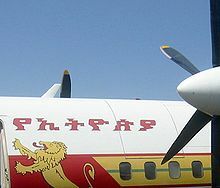 The Ethiopic writing system is visible on the side of this Ethiopian Airliner: it reads "Ethiopia's": የኢትዮጵያ ye-Ītyōṗṗyā. Amharic label of a Coca-Cola bottle. The script reads ኮካ-ኮላ (koka-kola). Seamhare ke polelo yeo setlogo sa yona e lego Ethiopia. Letlakala le fetotšwe la mafelelo ka 14:09, 25 Hlakola 2016.